Where Am I Going, Again? Last week, we got to spend some time in Johnson City, KS. I know…I had to look it up, too! Johnson City is in the far southwestern corner of the state and is only a few miles from the Colorado and Texas borders. It was quite literally the “middle of nowhere.” While a remote destination, the people of Johnson City, KS, couldn’t have been a nicer bunch! 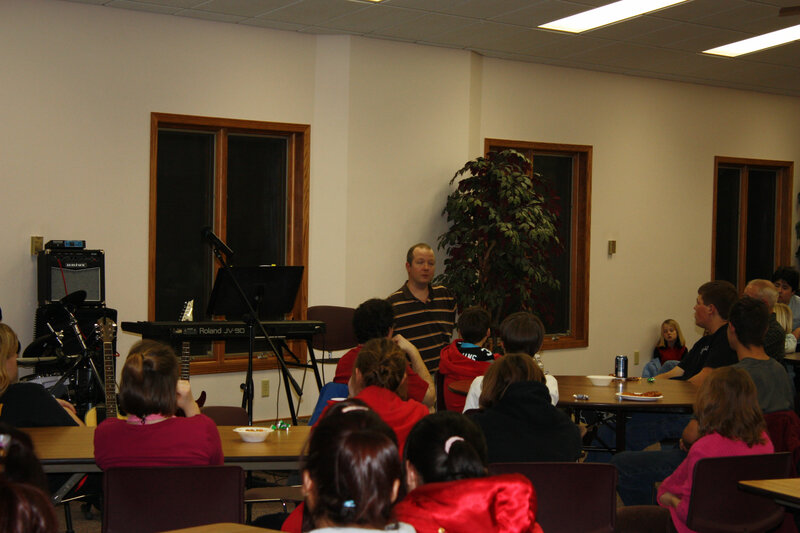 Our trip began at a Wednesday night service at Fields Memorial Wesleyan Church to a group of teenagers and adults. We had a wonderful evening of pizza, worship, and a message to get those in attendance to ponder what it means to be a positive Christian. I believe that’s the only way Christians can serve and carry out God’s will in the world…we must be a happy people! On Thursday, I began the morning at Stanton County High School, speaking to the students there about truly living life for all it’s worth, and about not letting any obstacle get in your way. We had a blast during the question and answer time that I always try to incorporate in my school presentations. The students asked questions for a good thirty-five minutes and we had a great discussion on how to approach others with disabilities…along with some fun stuff like answering how I play Rockband 2! Thursday night, I spoke at the Life Support Crisis Pregnancy Center’s Annual Banquet. This event was the main reason for being in Johnson City, KS, and the banquet was wonderful. So many people showed up that the hosts had to put out more tables! We met so many people with their own stories of hope and inspiration, and I loved being able to encourage and support Life Support in their efforts. We had a fabulous time with Lisa (the Exec. Director of Life Support) and her wonderful family! We felt right at home in Johnson City! I will be telling the story of my life and encouraging the students at Adrian High School to live life with a smile! We just returned from a fantastic tour of several spots in Tennessee and Arkansas. The trip started on Wednesday, the 15th, at the Concord Road Church of Christ in Brentwood, TN where a cousin and her family attend. My dad and I presented “All He Needs For Heaven” and we enjoyed having worship led by my cousin’s son. I love being with family. On Thursday, I spoke to the David Lipscomb Campus School with my “I’m Not Broken” presentation. I had a blast with the students there as they were extremely attentive and had lots of great (and sometimes hilarious) questions for me. There were over 700 students in attendance, and I’ve never seen such a respectful audience. Usually, I kind find a few people talking or playing with cell phones, etc…not in this group of kids! They were awesome! They allowed Jesus to shine through their wonderful attitudes. 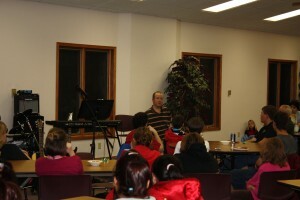 On Friday, I got to speak at Friendship Christian School (FCS) in Lebanon, TN. At FCS that day, they held “Commanders in Action” day. (Their mascot is the commander.) For many years, now, the school has held a day when students with disabilities from all over the county can come and enjoy a festival. Each FCS student is paired with a student who has a disability, and they spend the day getting to know each other and playing games. I told the students how proud of them I was, and I believe they were truly accomplishing Jesus’s mission of showing love to everyone. They were a fantastic group, and I believe the beauty of Jesus could be seen in them and in their actions. On Sunday, my dad and I again delivered our message to both the Otter Creek Church of Christ and the Hermitage Church of Christ. Both churches have plenty of family members to catch up with, and the praise and worship at both churches made it a fantastic day. After a couple days of rest, we continued on to Bentonville, Arkansas. On Wednesday the 22nd, I spoke at the corporate offices of Wal-Mart. 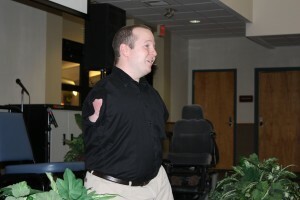 My assigned topic was disability awareness, and I got to tell them about my experiences in life and in the job force. I believe there many things that corporate America can learn to help make people who have disabilities feel wonderful. The executives at Wal-Mart told me that they learned a lot, and it also helped that I had them laughing through most of the presentation. That night I got to speak at the Decatur Assembly of God Church in Decatur, Arkansas. They could not have been more receptive to the message, and they were one of the most welcoming crowds I’ve ever had the privilege of speaking before. This was my first sermon to deliver by myself, as my dad had already flown home. I had a blast! While it was exhausting, and Hannah, Joni and I all wound up with colds, the trip was absolutely thrilling. God has opened so many doors, and we continue to be blown away at His generosity. I’ll leave you with a video shot at David Lipscomb campus school that tells a funny story of a time in junior high when a bully decided to pick a fight with me.